Ok… you have 3 takes of a great singer safely on your hard drive… How do you pick the best of all of those takes? Surely there’s a workflow for this. I mean aren’t there some shortcuts to make this cumbersome task easier?… or even FUN? I sat down the other day and shot a video to show you EXACTLY how I do this myself. I start off by showing you how you can set up Pro Tools to make this almost effortless. 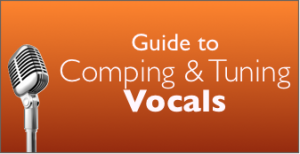 You’ll learn how to decide the best takes, lines and even how to edit syllables and get the ABSOLUTE BEST performance out of your singer. At the end of the video, I’ll show you a my personal workflow for using Melodyne. I’ll include all my shortcuts and tricks. And remember what I always say?… Make your vocalist look better than he already is and he’ll come back next time. Try this video out. If it doesn’t make you famous to your next vocalist, I’ll refund your money.